Turner and McIlwraith’s Techniques in Large Animal Surgery, Fourth Edition is an updated version of the classic resource for step-by-step instruction on basic surgical techniques in cattle, horses, swine, goats, and llamas. With detailed line drawings to demonstrate the principles discussed, the book addresses general aspects of surgery such as anesthesia and equipment and provides descriptions of surgical conditions and techniques commonly encountered in large animal practice. Now including a website with interactive review questions and the figures from the book in PowerPoint, the Fourth Edition is a highly practical, reliable guide for veterinary students and veterinary practitioners with a large animal caseload. The Fourth Edition includes eight new techniques and completely rewritten chapters on anesthesia, equine wound management, and surgical techniques in bovine and swine patients, as well as revisions to reflect advances throughout the book and updated references. 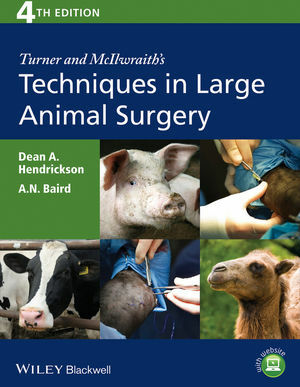 Turner and McIlwraith’s Techniques in Large Animal Surgery continues to supply students and practitioners alike with a valuable resource on the fundamental techniques of farm animal surgery. Dean A. Hendrickson, DVM, MS, DACVS, is Associate Dean and Professor of Surgery at Colorado State University College of Veterinary Medicine and Biomedical Sciences in Fort Collins, Colorado. A.N. Baird, DVM, MS, DACVS, is Chief of Staff of the Large Animal Hospital and Section Chief of Large Animal Surgery and Associate Professor of Large Animal Surgery at Purdue University College of Veterinary Medicine in West Lafayette, Indiana. Turner and McIlwraith's Techniques in Large Animal Surgery companion website features review questions and answers and the figures from the book for download into PowerPoint.